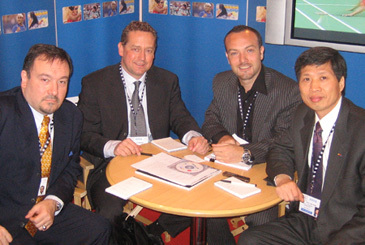 Mr. Luc Sougne (first from left), chairman of the WTF TV Committee, and Mr. Seok-jae Kang (first from right), director of the WTF PR Committee, pose with IEC in Sports officials on the opening day of the three-day SPORTELAsia 2006 at the Pudong Shangri-La Hotel in Shanghai, China, on March 20, 2006. The World Taekwondo Federation participated in SPORTELAsia 2006, which opened on March 20 for a three-day run in Shanghai, China. For WTF, it marked the first participation in such a global television exhibition. The Shanghai gathering attracted a total of 658 participants, representing 324 companies from 43 countries around the world, showing a 60-percent hike in the number of stands and a 25-percent increase in terms of participants from last year's inaugural SPORTELAsia in Hong Kong. "Our participation in the SPORTELAsia well shows to the global television community our willingness to actively involve in the television market," said Mr. Luc Sougne, chairman of the WTF TV Committee. Mr. Sougne continued, "We will continue to attend such events and keep contacts with key global television players." Representing WTF, Mr. Sougne and Mr. Seok-jae Kang, director of the WTF PR Division, attended the SPORTEL Asia, meeting with scores of broadcasters, cable and satellites services, program distributors, sports marketing agents and producers. Among the SPORTEL participants, IEC in Sports, Total Sports Asia, EBU, Korean Broadcasting System and KBS Sky show great interest in working with WTF. "As a follow-up to our meetings, we will soon have another meetings in Seoul as most of the participants we met in Shanghai are scheduled to visit Seoul in early April this year to attend SportAccord 2006," said Mr. Sougne. WTF serves as the secretariat of the SportAccord Seoul Organizing Committee. SportAccord 2006 begins April 3 for a five-day run at the Grand InterContinental Hotel in Seoul. SPORTEL's next event is the 17th SPORTELMonaco 2006, which is to take place on Oct. 16-19 in Monaco. The SPORTELMonaco 2005 drew 1,884 participants, representing a record 868 companies from 65 companies, making it one of the largest SPORTEL events ever.